Click here to visit the MTS YouTube Page to view our Action Videos! MISSISSIPPI THUNDER SPEEDWAY RELEASES BEAUTIFUL FULL-COLOR PRINTABLE SCHEDULE FOR 2019 SEASON! MISSISSIPPI THUNDER SPEEDWAY is happy to release a printable FULL-COLOR copy of the schedule for the upcoming 2019 season. 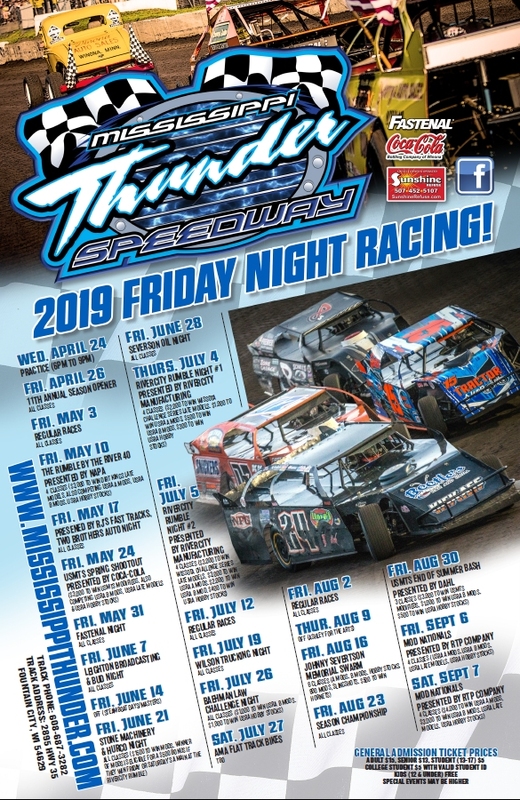 "We are glad to provide this printable copy of our 2019 schedule", said MTS Promoter Tyrone Lingenfelter, "so that racers, fans, sponsors, and supporters can print a copy and hang it in a convinient location so that they and their friends will always know what's coming up next at MISSISSIPPI THUNDER SPEEDWAY!" MISSISSIPPI THUNDER SPEEDWAY ANNOUNCES MORE FUN AND MONEY FOR 2019!! A-Mod Purse Increase, Along With 2019 Polaris 450 Sportsman & Vegas Vacation Giveaways for Fans! MISSISSIPPI THUNDER SPEEDWAY is excited to announce a major increase to our USRA Modified payout for the entirety of the 2019 season! RiverCity Manufacturing USRA Modifieds will now be racing for a cool $1,000-to-win, and $100 to start for all 2019 regular weekly shows! 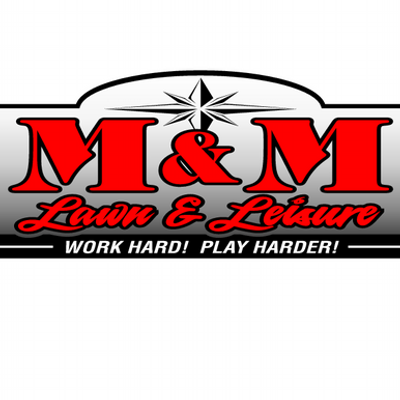 This includes $100 that Wehrs Machine donates to the winner's pay. "We believe with this payout MISSISSIPPI THUNDER SPEEDWAY has the highest Modified purse in our region," commented new Speedway Promoter Tyrone Lingenfelter, by way of a social media post on MISSISSIPPI THUNDER SPEEDWAY's FaceBook page, "The Modified class has been a longtime fan favorite and .... we are hoping that this increase in pay will give drivers an incentive to make plans to attend MISSISSIPPI THUNDER SPEEDWAY on Friday nights." Top 5 payout will look like this: 1st - $1,000, 2nd - $700, 3rd - $500, 4th - $400 and 5th - $300. MISSISSIPPI THUNDER SPEEDWAY's final schedule will be announced very soon with the 2019 Season Opener already scheduled for Friday, April 26th! A second announcement, that produced almost immediate excitement throughout social media, is something that people at the 2018 Championship Awards Banquet heard about, but is now being released to the entire public; MISSISSIPPI THUNDER SPEEDWAY will be having a massive fan celebration / giveaway night on Friday, August 30th - the Friday of Labor Day weekend! There will be three huge prizes that fans will have a chance to win. Each night an adult fan visits a race at MISSISSIPPI THUNDER SPEEDWAY they will receive a special ticket as they come through the front gate; these tickets can then be placed in a special celebration prize bucket by the MISSISSIPPI THUNDER SPEEDWAY apparel trailer. On Labor Day weekend all of these tickets will be combined into one big bin and winners will be drawn! In addition to the three main 'Grand Prizes', there will be a near 'over-flow' of many other prizes, including TVs, gift cards, racing related apparel, etc.! 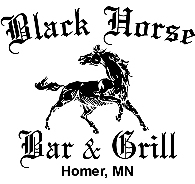 In order to be a winner, though, the race fan must be present at the Friday, August 30th Labor Day Weekend event! So, make sure to make plans for Friday, August 30th as you surely won't want to miss this night! 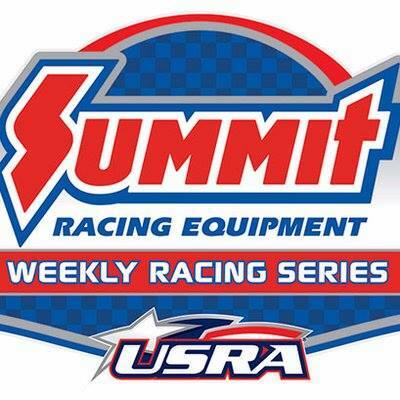 The third announcement released is that our MTS Hornets will now be running under USRA Tuner rules. While MTS Hornets will not be an actual sanctioned division, the class will follow USRA Tuner rules. More details will be made available soon concerning some specifics of the rules but this decision should make for a more competitive field of Hornets at MISSISSIPPI THUNDER SPEEDWAY in 2019. After the 2019 season MISSISSIPPI THUNDER SPEEDWAY will evaluate how the season went and make a determination if MISSISSIPPI THUNDER SPEEDWAY would like to sanction the Hornets in 2020. 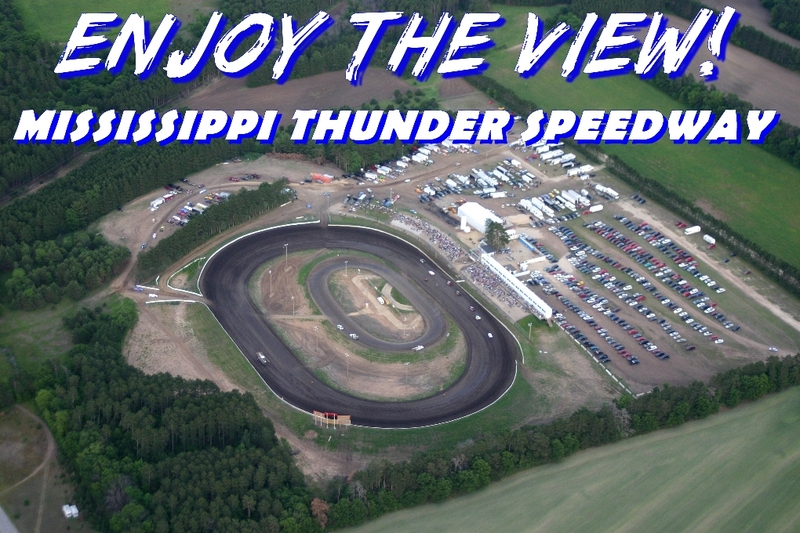 MISSISSIPPI THUNDER SPEEDWAY is very excited to get the 2019 race season under way and hope that all drivers and fans alike are just as excited as well! MISSISSIPPI THUNDER SPEEDWAY 2019 SEASON SCHEDULE COMING INTO FOCUS! MISSISSIPPI THUNDER SPEEDWAY's preparations for the 2019 Season have begun! 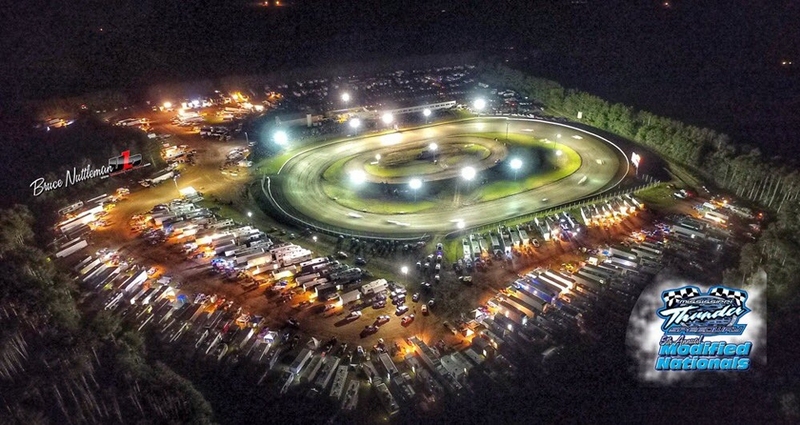 The release of initial scheduling details is painting a picture of what promises to be an amazing and exciting season-long celebration of action at the fast, wide and racy "BIG 1/3-MILE". Situated just an echo away from the banks of the Mighty Mississippi River that creates the border between West-Central Wisconsin and South-Eastern Minnesota, MISSISSIPPI THUNDER SPEEDWAY has become a "Must Visit" destination for racers and fans, alike; and the 2019 schedule has already amped up the excitement for another season of fun! REDBOX+ 600 Mods & Sunshine Refuse "SR" & "JR" Slingshots competing on a widened & lengthened "LIGHTNING SPEEDWAY"! A tentative 2019 schedule has been put together which once again presents all the ingredients necessary to make Friday Nights at MISSISSIPPI THUNDER SPEEDWAY the "Must Be There" destination for racers and race fans alike! MISSISSIPPI THUNDER SPEEDWAY is truly excited to be looking forward to the 2019 season - and we hope you will join us for another year of FAST AND FURIOUS FAMILY-FRIENDLY FRIDAY NIGHTS!!! MISSISSIPPI THUNDER SPEEDWAY INVITES RACE FANS TO DOWNLOAD THE ALL NEW MTS APP! MISSISSIPPI THUNDER SPEEDWAY is taking Good Ol' Dirt Track Racing to the Next Generation with the introduction of the all new MISSISSIPPI THUNDER SPEEDWAY App; download it today, from the App Store FOR FREE! 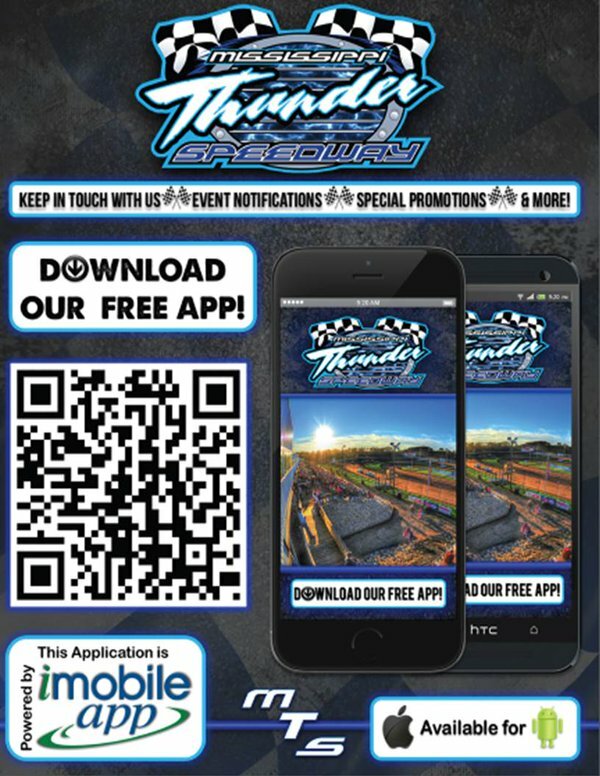 The all new MISSISSIPPI THUNDER SPEEDWAY App allows users to conveniently gather the latest information related to MISSISSIPPI THUNDER SPEEDWAY via their favorite mobile device! All of this information, and more, available from the convenience of your own personal device! So, visit the App Store today, and download your own personal "front door" to MISSISSIPPI THUNDER SPEEDWAY . . . the all new MISSISSIPPI THUNDER SPEEDWAY App! MISSISSIPPI THUNDER SPEEDWAY INVITES YOUNGSTERS TO JOIN THE "MTS KIDS CLUB"!! One of the main goals for MISSISSIPPI THUNDER SPEEDWAY owners Bob and Paula Timm and Tom and Tina Lockner, when they first bought MISSISSIPPI THUNDER SPEEDWAY was to make it a true "Family Friendly" destination. In an effort to make sure that race fans of all ages are enjoying themselves, MISSISSIPPI THUNDER SPEEDWAY is happy to announce the creation of the "MTS KIDS CLUB". Youngsters can join the "MTS KIDS CLUB" for a chance to make their next visit to the track a truly memorable occasion. Each and every race night, a lucky member of the "MISSISSIPPI THUNDER SPEEDWAY - JR. FAN CLUB" will be selected for a special prize! A chance to be a "Junior Race Official", waiving the flag during a REAL RACE on top of the official MISSISSIPPI THUNDER SPEEDWAY Flag-Stand! An official trip into the pits to see the mechanics working on a real race-car . . . maybe even sit in the driver's seat and wear the helmet! A chance to meet your favorite MISSISSIPPI THUNDER SPEEDWAY race-car driver - and get their autograph! A chance to meet the official MISSISSIPPI THUNDER SPEEDWAY race announcers - and actually announce a race or two to the entire crowd! A trip to the official MISSISSIPPI THUNDER SPEEDWAY Victory Platform to award the big trophy to the race winner! Maybe something different and even MORE EXCITING! For more details, click the "MTS Kids Club" link at the top of the web site, or click right here. Let the young race fans of today, make awesome racing memories for tomorrow, by joining the MTS KIDS CLUB! live up-to-the-minute lineups on your smart phone (or other wireless device) by following this link.